Most professional photographers know about the rights of their subjects when shooting photos and video. 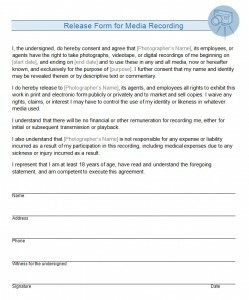 To be able to use multimedia with other people in their shots, photographers need a photo release form. This form, when signed, allows photographers to use pictures of their subjects in any manner they wish. Even freelancers and amateurs know that acquiring a signature for their photos is a necessary part of the job. In these instances, a preformatted template would come in handy. The free Photo Release form template helps photographers of all kinds to protect themselves from any kind of legal trouble while recording their media. With the photo release template, you’ll be showing professionalism in your work. Covering all your legal bases is important, in this line of work especially. Let’s get you started using the release form. As you read through the form, you’ll notice placeholder text between lightly colored brackets. These areas will be needed to be completed. First, fill in the photographer’s name in the appropriate area. Continue through the form and fill in the dates that you’ll be recording your images. Move on to enter the purpose of your photography. Make this part short and sweet. Finish the bottom portion of the template. It includes the subject’s name and signature, address, phone, and finally a witness signature. The photo release template can be used in a variety of ways. You can clear out the areas in between the brackets and print out the form for easier use while in the field. This is the way a variety of photographers go. The second option is to enter the photo session details while using Microsoft Word. Then, simply print the document and get the necessary signatures. You can coordinate this with company or personal branding. Use a different font or different set of colors to customize your form. Adding a logo would also be a smart move in making this release form look more professional.